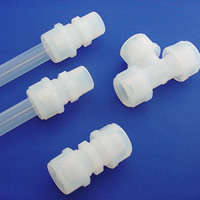 Fluorocarbon resin Tube Fittings 20,20A Series has a unique construction in that the ring is inserted inside the tube. (Pat.Pend.) 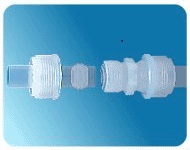 The tube expands due to the ring as shown until the outside diameter of the tube exceeds the hole diameter of the nut preventing from a possibility of coming off. By tightening the nut,the tube will be sandwiched between the tapered part of the main body and the inside ring ensuring an excellent seal. 20A Series is the sister model of 20 Series and their applicable tube size are φ3/8"-φ1". Though the body and nut are interchangeable, the rings are slightly different from those of 20 Series in size and shape except the internal diameter. 20A Series can be used by only replacing the part of the insertion tool for 20 series (the ring attachment). This series has less fluid trapping than 20 Series.